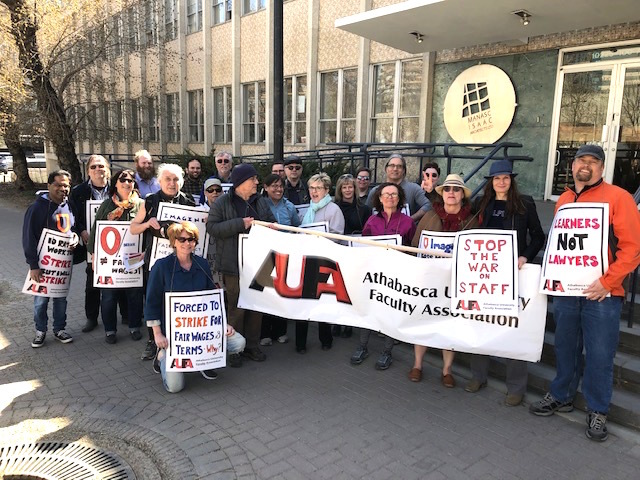 This afternoon, 20 members and 4 allies of the Athabasca University Faculty Association (AUFA) picketed the place of business of Athabasca University (AU) Board of Governors (BoG) chair Vivian Manasc. This was AUFA’s third information picket. We had 12 first-time picketers, including one who said "Is it a little weird that this is the only time I get to meet my colleagues?" 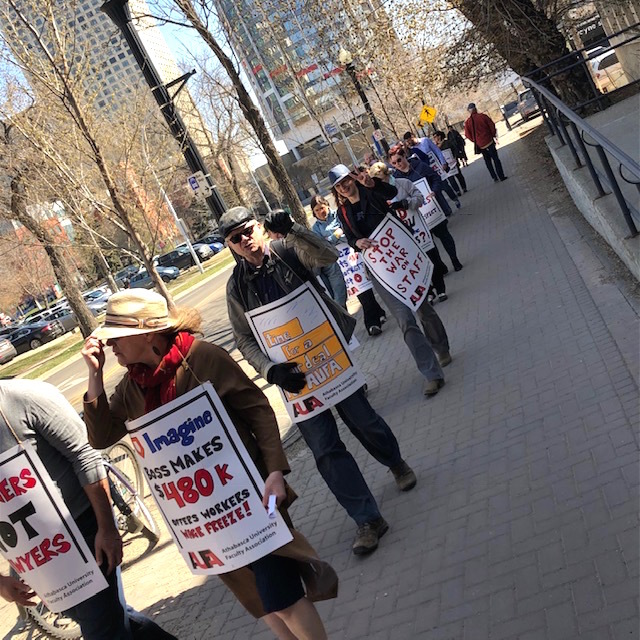 The purpose this picket was to show AUFA members’ growing displeasure with AU’s foot dragging at the bargaining table and demonstrate that, should a work stoppage occur, it will be most unpleasant for individual BoG members. Passersby were handed leaflets outlining AUFA’s concerns. 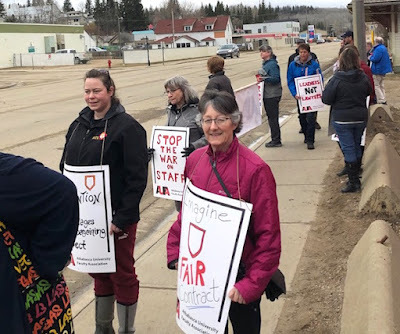 The most interesting part of the picket was an interaction with a worker from Manasc Issac who, while walking through our picket line, volunteered that we should go picket the workplace of AU President Neil Fassina because he is the one who is calling the shots in bargaining. This is the first independent verification we’ve of our suspicion that Fassina is the architect of AU’s bargaining strategy. two further years of waged to be negotiated (and resolved by arbitration). This proposal is broadly consistent with other provincial settlements as well as the settlement recently reached between AU and its support staff. Bargaining was halted after two hours this morning because the employer, who requested the additional session, had no meaningful proposal to make when AUFA got there. The BoG bargaining team has stalled bargaining since last May. It delayed the exchange of proposals, it advanced unreasonable proposals (that it has since abandoned), and it has been unavailable to bargain for long periods of time. It has also stalled the negotiation of an essential services agreement (which is a pre-cursor to formal mediation) and has now stalled informal mediation until mid-June. The next dates for bargaining appear to be June 17 and 18 with a mediator. 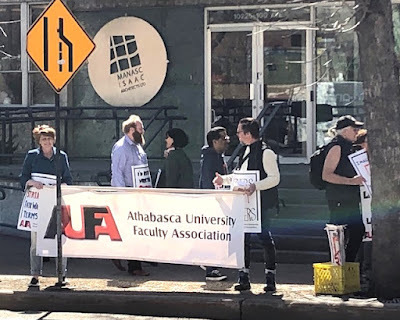 AUFA will be hosting more picketing events between now and then. 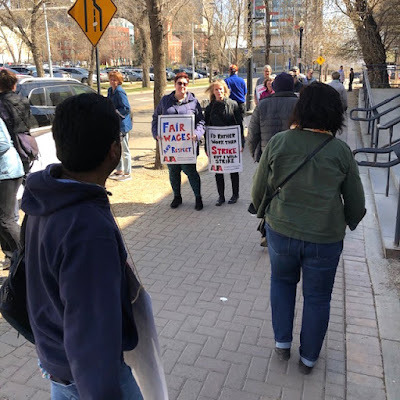 AUFA appreciates representatives from CUPE 3911, the Edmonton and District Labour Council, and the Confederation of Alberta Faculty Associations who joined our picket line this afternoon. 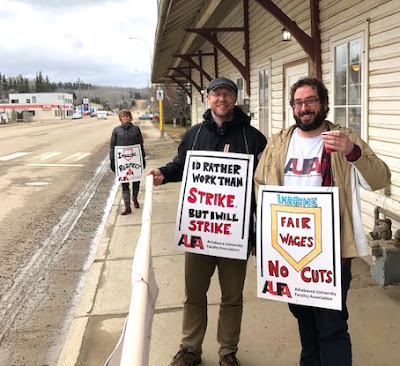 Yesterday, the Athabasca University Faculty Association (AUFA) hosted its first information picket in Athabasca to coincide with our 19th day of bargaining with the employer. 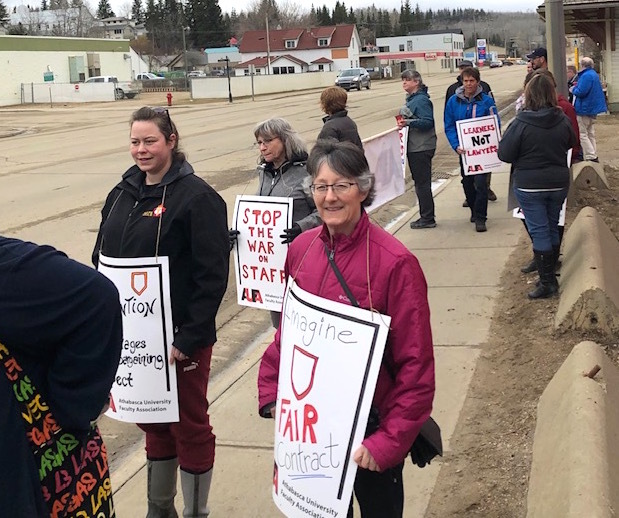 AUFA members are demanding a fair collective agreement on par with other public-sector agreements in Alberta. AUFA's proposal is currently a two-year wage freeze, improved job security for precarious members, and a two-year wage re-opener. Athabasca University is presently offering two zeros. There is no reason for the university to not improve language for precarious faculty or agree to further negotiations for financial settlements in future years. This year, the university recorded at $9m surplus and saw enrollment growth of 12%. The university also concluded a pattern agreement (two zeros, a re-opener, and small improvements) with its support staff only a few months ago. There were 37 people on AUFA’s picket line, including 32 AUFA members (roughly 1/3 of our members in town). We were also joined by members of AUPE and CUPW. 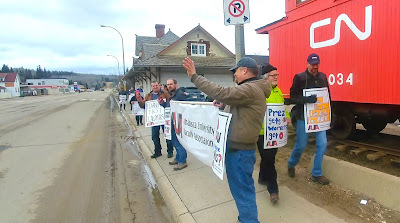 Residents of Athabasca waved and honked in support. 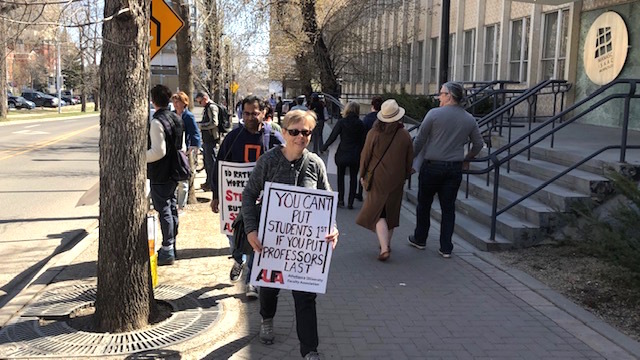 AUFA and the university are back in bargaining on April 23. This post original appears on the Parkland Institute blog on April 3, 2019. The United Conservative Party (UCP) election platform contains several planks affecting employment law, labour law, and training. These changes are framed as “bring balance back to Alberta’s labour laws, restore workplace democracy, and incentivize the creation of youth employment” (p. 21). The overall effect of the UCP platform is, however, to directly or indirectly reduce workers’ wages in order to benefit employers. The UCP platform promises a number of changes to Alberta’s employment laws. Employment laws are the primary source of workplace rights for the 75% of Albertans who are not covered by a collective agreement. The most significant change is related to over-time (OT) pay. At present, workers who are required to work more than 8 hours in a day or 44 hours in a week must receive 1.5 times their normal pay for this OT work. Over-time pay is designed to dis-incentivize employers from requiring long working hours (which create a fatigue hazard) and, instead, hire more workers. The current OT rules allow employers and workers to enter into agreements where OT is “banked”. In practice, employers can impose such “agreements” at their discretion by denying workers OT if they don’t agree to the employer’s terms. Banked OT can then be taken as paid time off or as pay calculated at 1.5 times workers’ normal rate of pay. Employers can deny employees time off in lieu of pay, thus forcing workers to take a pay out. The UCP indicates it will allow employers to pay out banked over-time hours at “straight” time, instead of at the OT rate. This will allow employers to evade OT premiums by denying worker requests to use banked OT. Instead, employers will be able to simply pay out the OT as straight time. The result will be a significant cost savings for employers, and a significant pay reduction for workers. For example, a minimum-wage worker (earning $15 per hour) being asked to work five 12-hour shifts, would have gross monthly earnings of $4200 under the current OT rules. Under the UCP proposal, an employer could impose an OT agreement and reduce the worker’s gross earnings to $3600 per month. This nets the employer a $600 savings per worker per month. Consequently, the UCP proposal will encourage employers to work existing workers harder, rather than hiring additional staff. The UCP has also promised to reduce the earnings of workers who are under the age of 18 to $13/hour (from $15/hour). This plank is intended to incentivize employers to hire young workers. There is no compelling evidence that such a policy would result in employers creating additional jobs for young teens. It may, however, incentivize employers to hire young teens in lieu of older workers (who comprise the vast majority of minimum wage earners in Alberta). Implementing a lower youth wage benefits employers. For example, assuming a 40-hour work week, an employer who replaces an older worker with someone under 18, will save $320 per worker per month. The UCP also promises to discuss reducing the minimum wage of workers who serve alcohol. This suggests a return to the two-tier minimum-wage for alcohol servers that existed under past Conservative governments. Finally, the UCP has also promised to replace Alberta’s present laws about farmworker rights. As previously reported, this proposal will deny 70% of paid farmworkers basic employment rights as well as reducing worker access to injury compensation. At present, Alberta workers are free to decide whether or not they wish to join a union, free from employer interference. If a union has the support of 65% or more of workers, they can apply for immediate certification (this is called card-check certification). If the union has the support of at least 40% but less than 65% of workers, then the Labour Board holds a vote and the majority decides whether or not to unionize. If the employer interferes in the workers’ decision, the Labour Board can automatically certify the union. The UCP platform promises to eliminate card-check certification and make every union certification application subject to a vote. The delay inherent in mandatory votes gives employers the opportunity to pressure workers into rejecting unionization, and employer intimidation of workers during union drives is commonplace. One Canadian study found that 80% of employers oppose certification drives, 60% do so overtly, and 20% take action that is illegal (e.g., threatening or dismissing workers). Not surprisingly, card-check certification provisions dramatically increase the success rate of union drives. The UCP platform frames eliminating card-check certifications as “restor[ing] workplace democracy” (p. 21). This attempt to equate certification votes with the electoral process ignores the fact that, when we cast a vote in a federal or provincial election, the government doesn’t spend the campaign period threatening to fire us if we vote for a different party. Such claims also ignore that elections and union drives are fundamentally different. Government policies profoundly affect every aspect of our lives and can’t be avoided (unless we abandon our country and citizenship). By contrast, the selection of a bargaining agent affects only certain aspects of our employment and the effects (typically higher wages and greater job security) can be avoided by changing jobs. The UCP platform is silent on two other important changes to Alberta’s labour laws implemented by the Notley government: remedial certification when employers interfere in union drives, and first-contract arbitration when employers stall collective bargaining to try and break new unions. Overall, these platform planks appear designed to reduce workers’ ability to join a union and limit the strike power of public-sector unions. These planks benefit both employers (who typically seek to avoid unions) and a UCP government (which would likely be keen to drive down public-sector wages). The UCP platform contends there is a need for more apprenticeship training due to retirements among skilled workers. Alberta’s occupational demand and supply model (forecasting to 2025) does not support this assertion. Instead, it predicts a surplus ofworkers in most skilled trades. Increasing the number of qualified workers will, however, further loosen the labour market, likely driving down wages. While he was the federal Minister of Immigration, Kenney used fears of labour shortages to flood Alberta with temporary foreign workers. This, in turn, meant employers did not have to increase wages or improve working conditions in order to attract workers. there is high attrition among apprentices, in part because only 1 in 5 employers that use skilled trades people offer apprenticeship opportunities. Overall, the UCP’s platform attempts to solve a non-problem by increasing training capacity. This approach has been demonstrably ineffective for decades because it ignores the barrier posed by employers’ unwillingness to provide apprentices workplace experience. If successful, the main beneficiary of the UCP’s training planks will be employers, who will be able to pit surplus workers against one another and drive down wages. The UCP’s claim that it will “bring balance back to Alberta’s labour laws, restore workplace democracy, and incentivize the creation of youth employment” (p. 21) is false. Instead, the UCP’s platform will increase employer profitability by lowering wages. Directly reduce the wages of young workers and workers who are required to work over time. Increase employer interference in workers’ decisions about unionization in order to reduce unionization rates and thereby, indirectly, drive down wages. Flood the labour market with skilled workers (in response to an imaginary skill shortage) and thereby, indirectly, drive down wages. Note: This post originally appears on the Parkland Institute Blog on March 21. Among the United Conservative Party’s (UCP) agriculture-related election platform is the pledge to repeal 2015’s Enhanced Protection for Farm and Ranch Workers Act (more commonly referred to as Bill 6). This UCP proposal would roll back the employment rights of workers in one of Canada’s most dangerous industries. In late 2015, Alberta’s NDP government extended basic workplace rights to paid, non-family farm workers. This legislation triggered outrage among Alberta farmers and ranchers, who (incorrectly) predicted that it would cause the demise of family farms. It took nearly three years to operationalize all of the changes due to extensive consultation with the agricultural community. Bill 6 eventually provided for mandatory workers’ compensation coverage, access to unionization and collective bargaining, and modified employment standards and occupational health and safety rules. The best-documented change is mandatory workers’ compensation coverage. In 2018, 4,009 employers enrolled their workers in workers’ compensation, up from 1,756 in 2015, when participation was still voluntary. In 2018, 16,767 workers filed 818 injury claims, up from 339 injury claims in 2015. Prior to the passage of Bill 6, approximately half of farm workers’ occupational injuries would have either been claimed under private insurance or simply not claimed at all. As part of its announced election policy platform, the United Conservative Party (UCP) has promised to "immediately launch comprehensive consultations" about farm worker rights, followed by the repeal of Bill 6 and the enactment of what the party calls the Farm Freedom and Safety Act. It is unclear if further consultations would yield a significantly different outcome, especially since large producer groups support the current arrangement. agricultural operations that have three or fewer paid, non-family employees over a substantial portion of the year will be exempt from the ambit of employment legislation. The UCP’s rationale for its agriculture platform is that the industry is in trouble, claiming that "since the NDP came to office, employment in Alberta’s agriculture sector has fallen by 19 per cent. That’s 11,300 jobs that no longer exist." Albertans should be cautious about accepting the UCP’s assertion that NDP policies have caused massive job losses for three reasons. First, agricultural employment has been declining for decades. While fewer Labour Force Survey (LFS) respondents reported that their primary job is in agriculture, that does not necessarily indicate that they no longer work in the industry—farming may just no longer be their primary occupation. Second, the LFS surveys 1,500 Albertans and extrapolates from their experiences to the population of 3.288 million Albertans who are aged 15 years and older. The LFS’s agricultural data is based upon answers from approximately 30 people. If five of those respondents experienced non-representative changes in their employment, this would change the number of reported agricultural workers by 11,000. The change reported by the LFS was not replicated in the 2016 Agricultural Census. The Ag Census (which looks at change over a longer period of time) found less than half of the 19 per cent decline in employment that the UCP claims. Overall, the UCP is likely overstating the true change in agricultural employment. Specific to Bill 6, the UCP is also likely confusing correlation (two things happening at the same time) with causation (one thing causing another). Research on workers’ compensation in the US suggests that allowing farmers to purchase private injury insurance (in lieu of workers’ compensation board coverage) will result in injured farm workers receiving worse benefits. Essentially, private insurers minimize payments to workers in order to generate a profit for their investors. Injured workers often have little capacity to resist this treatment because of their vulnerability. Private insurance companies are also more likely to engage in "creaming" behaviour, in which they choose to insure only those agricultural operators with low claims rates. This behaviour, in turn, incentivizes farm operators to pressure injured farm workers to not report injuries. Claims suppression transfers medical costs away from the farmer and onto taxpayer-funded health-care and income-support systems. It is difficult to know the full effect of the UCP’s promise that it would excuse farms with three or fewer paid employees from the ambit of "employment laws" while also "ensur[ing] basic safety standards" are met. Based on the 2011 Agricultural Census, it appears that only the largest 10 per cent of agricultural operations routinely employ more than three workers. These operations account for about 30 per cent of all agricultural work. What this means is that the vast majority of paid, non-family farm workers would likely be denied basic employment rights under the UCP proposal. Put another way, this proposal is a stealth attack on the basic labour rights of most farm workers in Alberta. The rationale for this exclusion centres on the notion that farms face different operational demands than other businesses, but rules currently in effect already balance the practical realities of farming against the need for meaningful workplace rights in one of Canada's most hazardous industries. This shouldn't be surprising given that the regulations were developed following an 18-month consultation with industry-dominated technical working groups following the outcry over Bill 6. If implemented, the UCP proposals would significantly reduce the workplace protections available to this vulnerable group of workers. The result will likely be a higher level of injury and worse benefits in the event of an injury. In effect, the UCP is trading farm workers’ economic security and health and safety in order to increase the profitability of agricultural producers. The underlying rationale for these changes—that increasing farm worker rights has somehow contributed to declining agricultural employment—is also suspect. Declining agricultural employment is most likely related to longer-term trends, such as increasing farm size and mechanization. More likely, this policy plank is an attempt by the UCP to capitalize on the anti-NDP sentiment that lingers in the wake of the introduction of Bill 6 in the early months of the NDP's mandate. It is also notable that many producer groups do not support rolling back farm worker rights, and that a law excluding most farm workers from basic workplace rights would be open to a constitutional challenge, although it is unclear who would fund such a challenge. 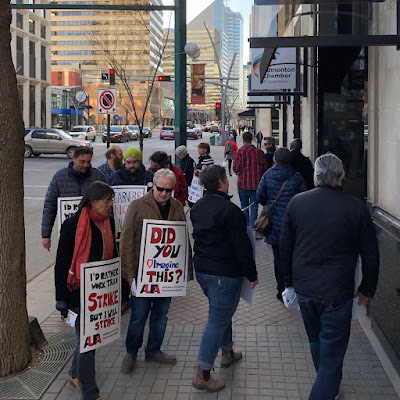 Yesterday, 15 members of the Athabasca University Faculty Association (AUFA) picketed a dinner event of the Athabasca University (AU) Board of Governors (BoG) in Edmonton. Board members were handed leaflets as they entered the dinner. To our knowledge, this was the first picketing ever at Athabasca University. The BoG bargaining team has stalled bargaining since last May. It delayed the exchange of proposals, it advanced unreasonable proposals (that it has since abandoned), and it has been unavailable to bargain since mid-February. It has also stalled the negotiation of an essential services agreement (which is a pre-cursor to formal mediation). 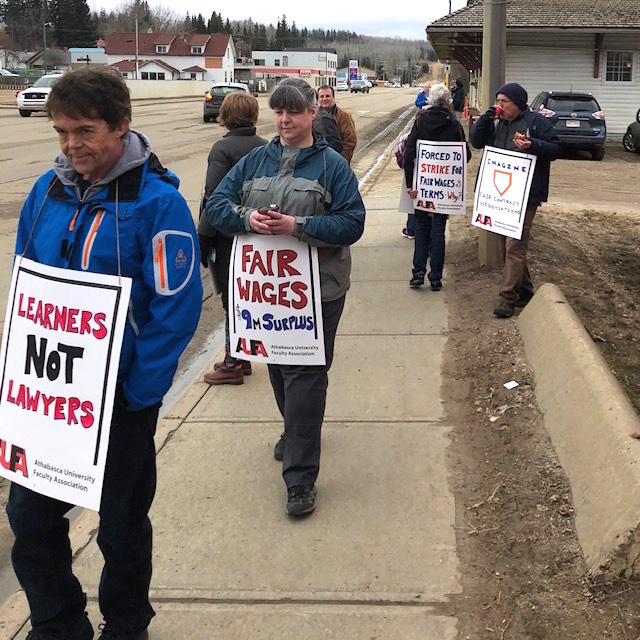 AUFA’s next information picket will be Monday, April 15 at noon in Athabasca. This picket coincides with the next (and only) bargaining date between AUFA and the BoG team. Last week, the Athabasca University (AU) Board of Governors (BoG) Human Resource Committee (HRC) voted down a proposal by the Athabasca University Faculty Association (AUFA) that would have brought four years of labour peace to AU. The HRC’s decision suggests they think they can drive a harder bargain at the table. The sticking points seem to be the duration of the contract and AU's unwillingness to contractually address its abuse of limited-term staff over the years. Whether the BoG itself supports such a decision is unclear because the BoG was never given a chance to vote on the proposal. (Indeed, the Bog seems to be completely in the dark about bargaining. And, oddly, AU ratified a similar contract with its support staff recently.) This rejection moves AU and AUFA one step closer to a work stoppage that will be profoundly harmful to AU and its students. 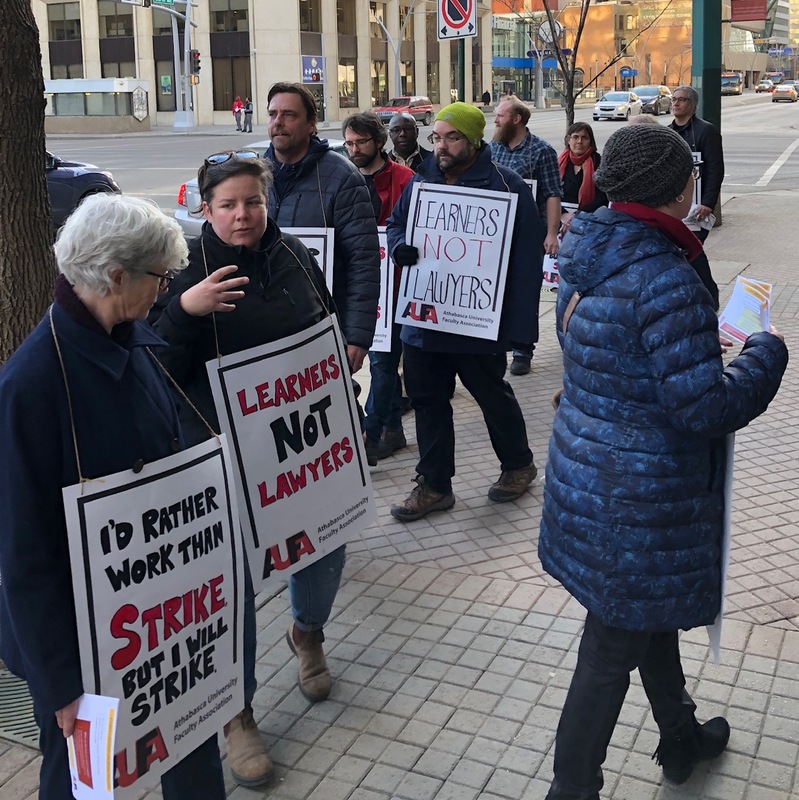 In the short term, AUFA continues to try to get an essential services agreement (ESA) so it can move towards formal mediation (the parties are at the Labour Board on this issue on April 8). There has also been one additional date of bargaining set (April 15). Absent a move by the employer, I would guess AUFA would be looking at a strike vote in June and (if the vote passes) a work stoppage in mid-September. AUFA will also commence information picketing in the next two (or three) weeks (presently awaiting advice on if and how the Elections Act may affect AUFA’s choice of targets). 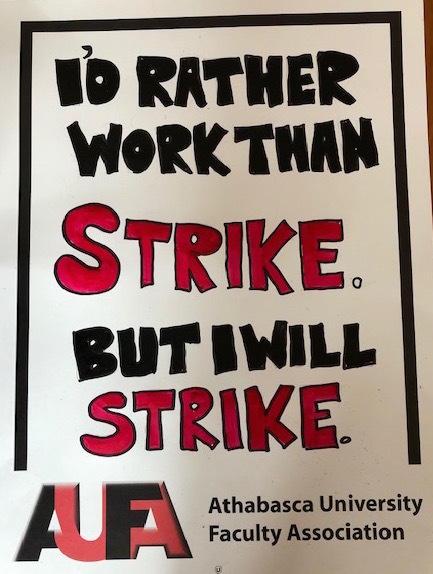 It is a shame AUFA must attack AU’s reputation as an employer in public because talk of a work stoppage will almost certainly affect enrollments in the medium term. But that’s where the HRC’s rejection has left the union and is apparently damage they are willing to risk. The most interesting discussion among AUFA members has been focused on the New Democrats' role in the current impasse. Many AUFA members wrote their MLAs, concerned about where AU’s behaviour was taking the institution. After a lengthy delay, they received a form-letter response form then-Minister of Advanced Education Marlin Schmidt in late February. 1. 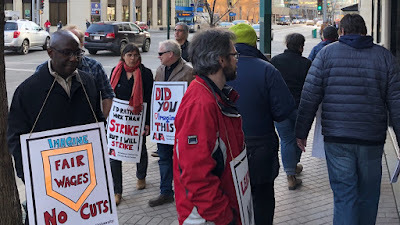 The government moved PSE bargaining under strike-lockout without the promised preparatory period (indeed, some bargaining was moved retroactively). This provided employers with a significant advantage that, according to one ND MLA, should result in lower wage settlements. 2. The government has given institutions a bargaining mandate. AU prevaricates about this, but there is clear evidence that other institutions received a mandate for at least a wage freeze. Government staff are monitoring bargaining closely. And, I’m told, institutions risk funding consequences if they deviate from this mandate. So, while the government claims its hands are tied, the NDs have certainly intervened on the side of employers in order to get two years of zeros (with future wage changes to be determined through further negotiations). 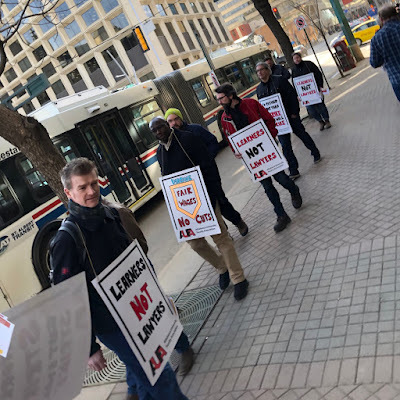 It is not lost on workers that, despite improving Alberta’s labour laws, the NDs have been no friend to labour on bread-and-butter issues. Rank-and-file unionists have been grumbling about this for awhile. Recently, Alberta Union of Provincial Employees present Guy Smith told Maclean's “There’s nothing compelling [workers] to go to the ballot box with their head held high, marking an X for the NDP." An AUFA member opined last week that we’ve done better bargaining under conservative governments than we have under the NDs. Another AUFA member flagged that wage freezes allows the NDs to reduce their deficit (for political gain) without having to raise taxes—in effect, the NDs have externalized a greater portion of the cost of government onto public-sector workers. Given how terrible the conservatives are, it’s unlikely that this will translate into public-sector workers voting conservative en masse. But pent-up demand for wage increases to match inflation does identify a likely area of contestation regardless of who forms the next government. This case study of Wabasca “focuses on the lived experiences of Indigenous working families in the oil industry and how working conditions impact families and gender relations” (p. 1). This study remedies the lack of attention paid by researchers to the economic, employment, or other benefits (and the tradeoffs among them) involving Indigenous communities and the gendered nature of these experiences. 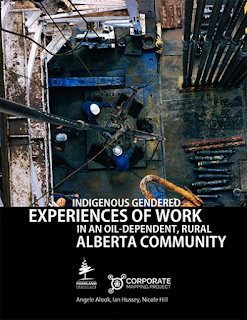 Overall, this is a very useful extension of the significant research done (primarily by University of Alberta scholars) on the social impacts of Alberta’s oil-dependent economy.